One of the two greatest female rock stars of the 1950’s alongside fellow Atlantic Records stalwart Ruth Brown, it was Baker who actually recorded first in early 1949 but had to wait until the mid-1950’s after Brown’s long run as the most dominant female artist in in rock was on the wane for her own career to take off. From mid-1954 through the end of the decade she made up for lost time with a run of hits that made her the only consistent woman on the charts in rock ‘n’ roll until the dawn of the girl group era. 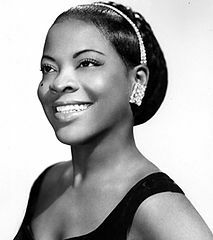 She was born in 1929 as Dolores LaVern Baker and had an enviable music pedigree. Related to Memphis Minnie, the most acclaimed female blues act of 1930’s and 40’s, and Merline Johnson, her paternal aunt who rose to notoriety as The Yas Yas Girl, named after popular ribald lyrics found in many blues songs of 1920’s, Lavern’s career seemed mapped out at birth. After a youth singing in church she set out on her own at 17 and landed at the Club DeLisa in Chicago, one of the most popular nightspots in the city, one which was opened 24 hours a day with song and dance never ceasing. It was there she was dubbed Little Miss Sharecropper, meant to suggest a connection to the popular blues singer Little Miss Cornshucks (Mildred Cummings) who was an excellent singer whose stage gimmick had her dressed in rags as if she was just taken off a Southern plantation harkening back to a bygone era, and it was an image Baker understandably found demeaning. Yet her performances were thoroughly modern with a big voice that was shaded with sophistication yet still able to pack an emotional wallop and she quickly drew notice from the city’s bandleaders, signed by tenor saxman Eddie “Sugarman” Penigar to be the featured female vocalist on his first solo recordings after being a notable session musician. Though her two sides were released on major label RCA in spring 1949 they didn’t break her as a recording artist but her stint with Penigar took her to Detroit as well where she entrenched herself as a popular club act at The Flame Show Bar, one of the hottest nightspots in the city where in a short time she met and befriended white singer Johnnie Ray who initially sang in an emotive black style that made him an unusual hybrid act for the day, not quite rock but not pop or jazz either. Yet while Ray was greatly influenced by Baker and credited her for helping to shape his style, it was Ray who found fame first cutting a double-sided smash on both the Pop and R&B Charts in 1951 before being transferred from the black oriented OKeh subsidiary to the parent label Columbia and steered towards more of a mainstream pop career. Baker had recorded a handful of sides for a few labels that went nowhere in the early 50’s still under the Miss Sharecropper moniker but finally convinced those managing her career to drop that offensive sobriquet and she next appeared on record with Maurice King & His Wolverines – who were the house band at the Flame – under the name Bea Baker. Though the records were good they didn’t catch on far outside of that region. 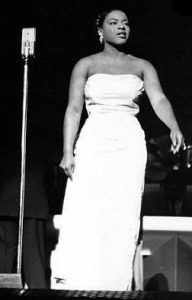 It did lead to her next big chance when local bandleader Todd Rhodes, who’d scored two early rock hits in the late 1940’s himself, was looking for a new female vocalist for his act and hired her, finally under the name for which she’d become famous, LaVern Baker. Though they released a few records on the King label that didn’t chart it did get her far more recognition and led to her touring Europe, becoming the first rocker to do so – all before she had even a minor hit! Upon her return in 1953 Baker was signed to Atlantic Records where they knew exactly the type of tough musical backing she was best suited for and provided her with the right support in the studio to allow her to maximize her potential. After an incendiary debut for the company – “Soul On Fire” – which may have been too powerful for the audience to instinctively grasp they struggled to find the perfect formula before stumbling across it with a childish novelty lyric wedded to a catchy mambo beat that was incredibly popular in 1954. The record “Tweedlee Dee” featured the top session musicians in rock including a vibrant sax solo by Sam “The Man” Taylor and was perfectly timed for rock’s growing crossover appeal. It hit the Top Five on the R&B Charts and the Top 15 on the Pop Charts despite a watered-down white pop cover version by Georgia Gibbs. The feisty Baker, already at 25 a veteran performer who’d traveled the world and with her experience had learned to stand up for herself, was infuriated at the blatant rip-off perpetuated by Gibbs and other white acts stealing their thunder and their sales and she petitioned her Congressman to revise the copyright laws to cover musical arrangements. Though nothing came of her calls for justice the publicity it garnered showed that Baker, and rock ‘n’ roll itself, were not merely content to enjoy the rising prominence that came with the move into mainstream American culture but instead they were insisting on the same respect afforded the white-bread musical styles. With the song’s success Atlantic continued mining the same stylistic vein – simple if not simplistic lyrics over tough backing tracks – but Baker chafed at continually being presented in this way even as it got her more hits, resenting the implication that she need to water down the lyrical messages so as not to offend innocent teenage ears (or their already irate parents). As a result of this battle of wills over content Baker infused even the most harmless songs with strong sexual undercurrents, turning something like the comic book boasts about “Jim Dandy” into one of her most suggestive odes to a man’s sexual prowess found on a Top Ten hit in the 1950’s. Her criticisms of Atlantic’s material also afforded her the opportunity to cut some of the first concept albums in rock, including a tribute to blues star Bessie Smith, giving Baker’s catalog far more variety than most rock acts at the time. In 1955 she was one of the first rock acts to appear on network television on a notorious segment of The Ed Sullivan Show, performances which briefly led to Sullivan banning rockers from his airwaves. However movie goers who’d never gotten a chance to see her in person were able to watch her on the big screen in two of the many rockploitation films of the era where her good looks matched her voice and gave further indication why she was such a popular attraction on stage. In 1957 she headlined an Australian tour with Bill Haley, Big Joe Turner and The Platters, making her among the first rock ‘n’ rollers to visit that part of the world as well. Her records remained top sellers and her hits ranged from rock torch classics like “I Cried A Tear” to the gospel-soul rave-up “Saved” showing stylistic versatility to be envied. But her growing independence and changing tastes led to a commercial downturn in the early 1960’s and by mid-decade she’d left Atlantic after a run of 27 hits in a dozen years on the label. She signed with Brunswick where she scored three minor entries including a duet with former Ravens lead Jimmy Ricks before her life took an unexpected turn. While performing with Jackie Wilson for the troops in Vietnam on a USO tour she got sick and was hospitalized with a collapsed lung, remaining in the region for months to recuperate. Basically abandoned with no way of contacting America in the middle of a war zone and suffering another relapse of pneumonia that required four additional months of hospitalization she was presumed dead and her stateside husband divorced her before filing to have her declared legally deceased so he could collect her royalties. Ever the fighter Baker decided to remain in the Philippines and worked entertaining the troops near the base to try and make money to get back home, but with little help from the US Embassy she made the best of her situation, building back her reputation as a performer in the region where she remained for the next twenty one years, running the entertainment unit for the troops who like her found themselves a long way from home in an alien environment and looked to her as a connection to the world they left behind. 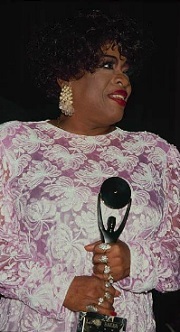 When Baker decided to finally return to the United States she came back in style as one of the featured performers at Atlantic Records huge 40th Anniversary Celebration at Madison Square Garden where she knocked everybody out with a performance that showed she hadn’t lost anything in her long time away. This led to one of the more remarkable and unlikely comebacks in history as she replaced old friend Ruth Brown as the star of the Broadway show Black & Blue, recording her first album in decades and being inducted into The Rock ‘n’ Roll Hall Of Fame. Baker lost both legs due to complications from diabetes and died in 1997 after an improbable life that took her around the world and back while helping to establish rock ‘n’ roll as the music that conquered that world in her lifetime.